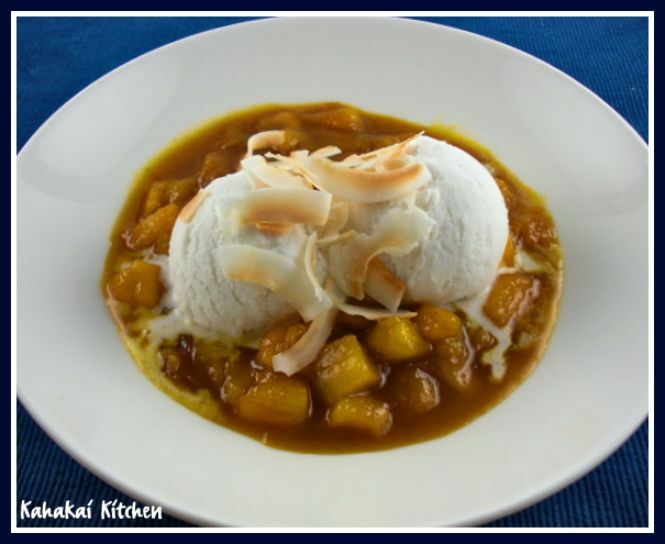 Kahakai Kitchen: Mango Jubbilee: Another Delicious Recipe from "Captain Cooked" + a Giveaway of TWO Autographed Copies of This Fun Foodie Mystery! 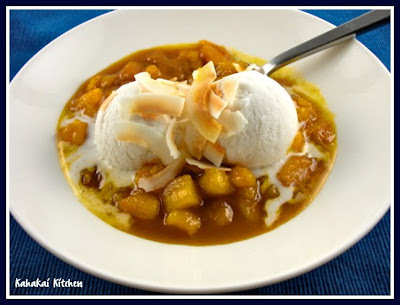 Mango Jubbilee: Another Delicious Recipe from "Captain Cooked" + a Giveaway of TWO Autographed Copies of This Fun Foodie Mystery! This Mango Jubbilee deserves a much better photo because it is REALLY good. Actually I mean REALLY, REALLY, REALLY, REALLY, good. (That's four all-caps REALLYs in there by the way) In fact it was so good that I didn't couldn't wait to let the mango cool, which would have made for a much prettier photo, but would not have been quite as decadent or indulgent as quickly plating it, snapping a few quick pics as the cold ice cream began melting into the hot, sweet mango sauce and then shoveling it in my mouth was. My definition of heaven just might now be fresh mango, brown sugar and butter with a little Kahlua and cream mixed in, served with homemade coconut milk ice cream and garnished with some toasted coconut. 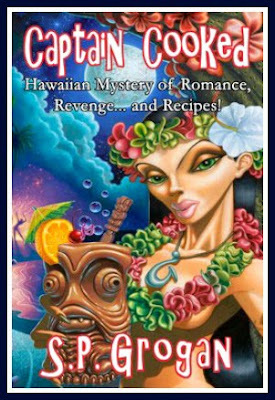 I had the pleasure of reading and reviewing "Captain Cooked: Hawaiian Mystery of Romance, Revenge... and Recipes!" by S.P. Grogan. You can read my review here. In the book Videographer Madison Merlot Dayne and her father, television food star Jeffrey Dayne, in Hawaii to film scenes for Jeffrey's show, eat their way around the Big Island of Hawaii, trying to discover who might have poisoned a popular local singing star among the other troubles and mysteries they find themselves inadvertently caught up in. (You can read more about the book on the Captain Cooked website here. With so many delicious recipes (25!) in this fun foodie mystery,I knew I would have to cook more of them. Alan Wong's Whole Tomato & Japanese Cucumber Salad with Li Hing Mui Vinaigrette was delicious and being that it was a fairly healthy salad, I thought I should try a decadent dessert for balance. I had a few fresh, local mangoes in the house, so I picked the simple Mango Jubilee recipe from Big Island Chef Daniel Thiebaut. The chef suggests serving it topped with coconut ice cream so I whipped up a quick batch with a little rum "kick" and toasted some coconut pieces for a little crunchy texture. Melt butter in a saute pan. Add brown sugar and mix well. Add diced mango and saute for 2 minutes, flambe with Kahlua Liquor and add cream. Place in soup plate with coconut ice cream on top. Mix all ingredients together and freeze in an ice cream maker according to manufacturers instructions. Place in a container in the freezer to firm up for an hour or two and serve. The rum is optional but adds nice flavor and makes the ice cream a bit more "scoopable"--always a bonus. Notes/Results: I said it all above--REALLY, REALLY, REALLY, REALLY, good! This is a quick and easy desert that you can throw together in a few minutes but would impress your dinner guests, if you choose to share it that is. Just don't set yourself (or anyone else) on fire when you flambe please. ;-) I will make this again, probably more than my hips will allow. After reading my post reviewing the book, the author, S.P. Grogan generously offered to send a couple of autographed copies of "Captain Cooked" so that I could give them away to a couple of lucky readers. So if it is the mystery, the romance, the setting of Hawaii, or maybe the many recipes like Crystallized Ginger Chicken, Kona Coffee Rubbed Steaks with Marsala Wine BBQ Sauce, Seared Big-Eye Ahi with Artichoke-Caper Polenta, Pineapple Bomber Cocktail, or Banana Papaya Sauce that make your mouth water, you will want to enter to win your own autographed copy! Two lucky people will win their own autographed copy of the book, plus I will be throwing a couple of little "surprise" local ingredients into the package to make cooking from it even more fun! The two winners will be selected by random drawing--so enter away. There are up to three different ways to enter, so if you really want the book and the "surprises"--you have up to three chances to win. Entry #1: "Captain Cooked" is set on the Big Island of Hawaii, so for one entry, leave a comment on this post telling me that if you were the star of your own foodie mystery, where in the world you would want your personal foodie mystery to be set? Entry #2: For a second entry, mention Kahakai Kitchen and this giveaway and link back to this post on your blog, or your Facebook page or if you are on Twitter, tweet about it. Then leave a second comment on this post letting me know that you linked, Facebooked or tweeted about it. Entry #3: For a third entry, become a follower of Kahakai Kitchen by clicking on the "Followers" box on the side bar of my blog and leave me yet another comment letting me know that you are now following me. Of course if you are already one of my loyal and beloved followers, just leave a comment letting me know that you are following for your additional entry. All entry comments must be in by midnight, (HST) Monday, August 16th. The two winners will be selected in a random drawing from of all of the entry comments received, and will be announced on Wednesday August 18th. (so make sure I have a way to contact you if you win!) Good luck! Many thanks to the author and publisher for providing such a fun prize! This looks amazing. I am drooling on my keyboard! Oh my. You've really outdone yourself here Deb. I've always wondered if you could make ice cream out of coconut milk...totally going to try it now! Does the coconut milk have to be chilled before you try to freeze it? This is too delicious for words! It deserves every cap it got. Lucky me, I have a mango in the kitchen. I was thinking sticky rice, but I think you have changed my mind! I would mind a foodie mystery adventure in Austria. I have so much to learn about the food there! Your mango jubilee reminds me of Bittman's mango sauce and coconut ice cream. 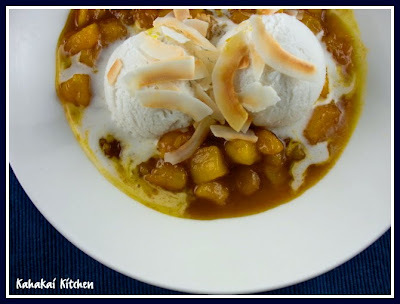 In fact it makes me appreciate this recipe for mango jubilee that much more!! Creamy coconut ice cream swimming in mango deliciousness. Fun giveaway! I think I'd like my foodie mystery to take place in either Italy or Greece. ohmygawd...so excited!!! First off....the drool factor is off the charts on this one. I must have some! Um, do you know that I toss the idea of where my culinary mystery would be located. Often. Since I do plan on writing one someday, I'd probably set it in Michigan...having grown up there and all, I know the "feeling". The people, the land, the secrets and mysteries, the nooks and crannies!!! Or else Nothern Indiana...perhaps it'd cross over since they're border states. OOOOOHHHH!! So excited ;) Thanks for the chance! What a terrific dessert with mango! It sounds totally delicious! And I love the ice cream too! Thanks everyone! I am enjoying reading your comments about where your mystery would be set! Joanne--I have done it both ways and usually the only time I chill it is if I warm it to dissolve sugar first but when I use agave, I mix and pour it in and don't notice a big difference. Natashya--I buy an organic coconut extract and find a judicious use of it really enhances the coconut flavor. (Too much can be a bit overpowering.) The vanilla rounds it out a bit. Kat--normally I am a cold mango fan too but it is hard to go wrong with a bit of butter and brown sugar--lol! If I were going to do a foodie mystery adventure, I'd like it to be in Australia. I've always wanted to visit there! PS - my word verification is 'leichips' ... I giggled. This looks like a lovely dessert! I don't like mocha flavour.. would Bailey's be an ample substitute? Deb you are super fun! I would want my mystery set in Scotland. Debs!@! How are you? Decided to visit your blog and now I'm entering the contest! That book looks fun and I'm aching for a little Hawaii - it's been too long... maybe next year sometime. We have embarked on a remodel and everything is crazy! If I could get away and get involved w/a foodie mystery, I'd want it to take place in Kailua/Lanikai. :-) Starting w/a cocktail at Buzz's. Ha ha. forgot to mention that the note above is from Flora. (I'm not that versed in leaving comments on blogs, I'm more of a "reader") Talk soon! The recipe reads and looks really, REALLY, good! I would definitely devour two helpings of this dish. My mystery would be in Ireland. I love Hawaiian novels! We have read a couple, but not this one. For my foodie mystery I'd love to be in the South Pacific with all the fresh fruits, fish and coconut... amongst the swaying palms of course...! I want my foodie mystery to take place in Equador. Cinnamon trees grow there and I love cinnamon. Plus I'm sure there are exotic fruits that I've never even heard of. I've bought coconut ice cream, but never made it myself....SO on my to do list! My foodie mystery would be in Japan! I've never been to Asia, and that is the country I'd most like to eat my way across. I don't use the blog follower feature, but I am subscribed by way of my Google reader, does that count? Hmmmm. I would pick a small town in Greece. If it were a real foodie mystery, I don't think I'd ever want it solved so I could stay and eat all the time ;). Yummy! I can't wait to try this! This is a forehead smacking, why didn't I think of this moment. It is like banana flambe, but with mango! And I can't wait to try the coconut icecream, too. Love it!